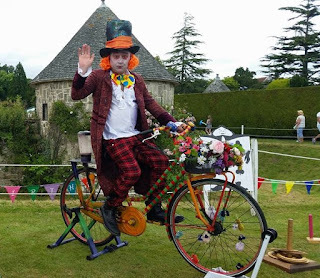 A Mad Hatter peddles smoothie bike / blender bike at annual Beaulieu Village Fete 2016. A very English, country garden affair in the New Forest the Beaulieu Village Fete raises money for local charities including Beaulieu Village School. Across the lawn 'Bill and Ben' the flower pot men made vegan pizzas. The recycled Dutch bike, now a peddle powered blender / smoothie bike offered a chance to grab 2 of your 5 a day, made with banana, strawberries and coconut milk.